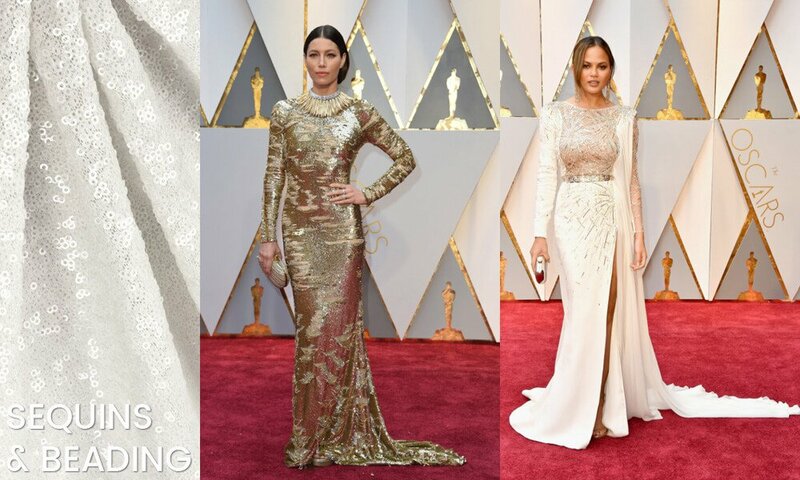 The Oscars brought the elegance and glamour to the red carpet once again in 2017. The trends were clear with plenty of velvet, sequins, lace, and couture embellishments. Pale gold, white, brilliant red, and midnight blue ruled the night, and black is, of course, never out of style. Long sleeves were also on trend, with high necklines joining the usual plunge. While these dresses cost thousands of dollars with thousands of hours of work put into the meticulous details, we’ll share our 3 favorite trends and ways you can achieve them with affordable fashion and dress fabrics. Also, watch the video to hear our thoughts about the high and low points of fashion at The Academy Awards. 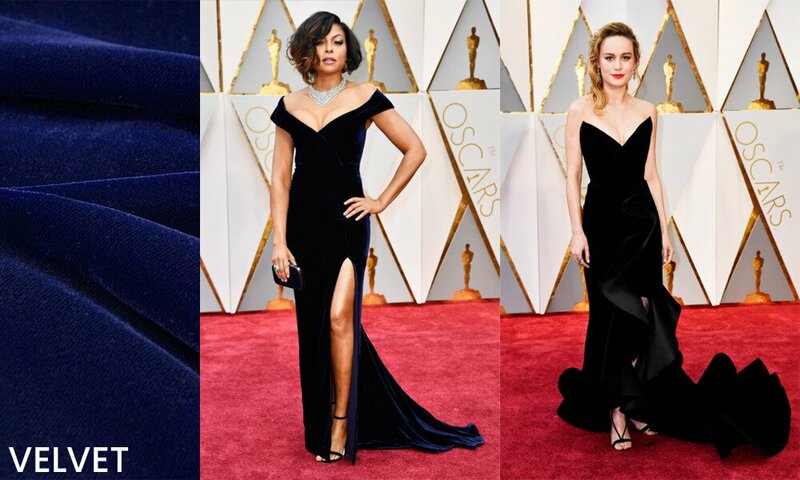 Our consensus favorite of the night was Taraji P. Henson’s sultry midnight blue velvet gown. Fit to perfection, we love the elegant neckline balanced with the high slit. Another one of our favorites was Brie Larson’s black velvet gown with another gorgeous neckline and ruffles. The men joined the velvet trend. Dwayne “The Rock” Johnson pulled off a deep blue velvet tux jacket. We have plenty of luxurious velvets, with our Fairvel Micro Velvet being the best suited for these kinds of garments. Gold shined above the rest, particularly pale golds and champagnes. 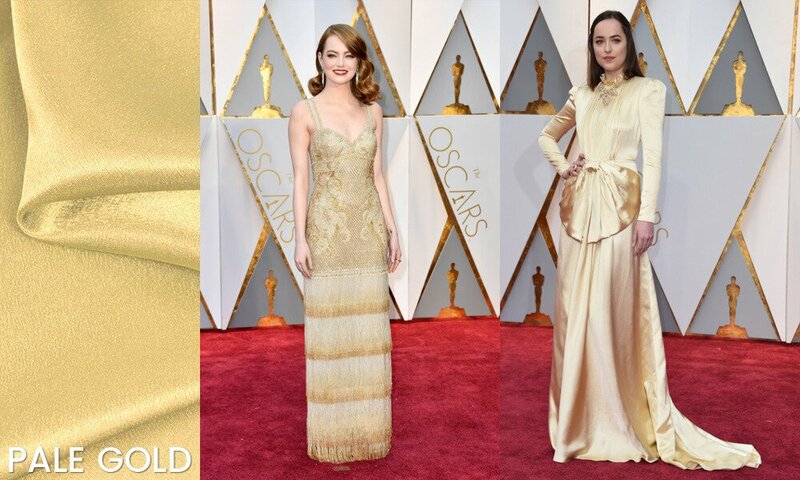 Another one of our favs was Emma Stone’s ’20s inspired gown with ombre fringe. There was plenty more champagne and gold wearers, including Jessica Biel, Charlize Theron, and Dakota Johnson. We have plenty of gold fashion and dress fabrics from satin to sequin. Other colors of note were multiple shades of white and brilliant red, worn by Viola Davis and Ruth Negga, among others. There was plenty of sparkle and glamour with sequins, beading, embellishments galore. Head turners included Janelle Monáe, Nicole Kidman, Sofia Boutella, Jessica Biel, and who doesn’t love Chrissy Teigen? Our Glitz sequins have a gorgeous drape and high-end look with an affordable price. Also check out embellished organza.